We are made of body, mind and energy body. Healing boosts your energy level by getting rid of fatigue and stress from your energy body and makes your mind and body healthier and stronger. This healing event is to support you to live your truer, healthier and happier self. Anybody is welcome! This will be non-contact healing that does not require physical contacts. Non-contact healing that heals a number of people simultaneously but separately is possible because energy can move through time and space. I would be very happy if I can connect with everyone in New York through healing and support them live healthier, happier lives. Anyone who has not had a healing therapy before is welcome to attend! Please just stop by if anything I write here interests you. If you participate in New York Marathon the next day, I will adjust your energy to help you set your best record. I am very much looking forward to meeting with you all at Central Park!! Place: The Great Lawn South in Central Park, NYC It is located near Turtle Pond, the South end of the Great Lawn. Directions: The closest park entrance from the East Side is Fifth Avenue at 79th Street; from the West Side, Central Park West at 81st Street. *In case of rain, this event will be cancelled. *Please bring your own mat or towel to sit or lie down on. Since this is an outdoor event, please dress warmly! I am waiting for you at the green arrow of the map. I’m waiting for you here. This is an open group healing event. Please freely join any time during the session. You do not need to stay for the whole time. You will be able to feel the effects well 20 to 40 minutes after the participation. I will be wearing a red sweat suit with a red cap on and will place a galaxy beach ball nearby so you can spot me easily. You can just come to say hello or you can bring something red (such as a red ribbon) as a signal, if you are very shy! When I signal you to begin, please relax and make yourself comfortable near me. You can either sit down or lie down. I will send energy to everyone at the event simultaneously. However, the level of energy needed or the form of the energy exchange vary by the individual even if they are being healed at the same time. When you begin, please focus your attention on your abdomen. Expand your abdomen as you inhale, and flatten and relax as you exhale. Repeat 10 times, and then relax. You will start to feel warm from the center of your body and be filled with a feeling of safety. If you wish to end the healing, please silently say “Thank you” to the universe before leaving quietly. ・Fill energy in dantian (tanden, below belly button) and make your body feel stronger and balanced. ・Get rid of unnecessary energy out of your body and fill it with life energy. ・Connect you and the energy of the universe to create a central axis. ・Fill you with the energy of love and protection. During and/or after the healing, you may tear, cough, feel a chill or pain, or remember unpleasant experiences in the past, due to purification. This happens when something that had interrupted your energy flow is getting purified. Do not worry and just enjoy letting it go to facilitate the process. This may continue for a few days after the healing. If you have any questions or would like to let me know of your participation in advance, though an appointment is not necessary, please email me in Japanese or in “plain” English. 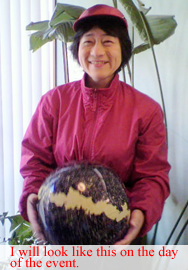 I am a Tokyo-based Japanese healer with 20 years of experience. I acquired healing ability through various energy work, psychic training and Buddhist training. I always feel that, deep in each of our subconscious, we are one and all connected. All of us are wonderful, beautiful and loved beings, regardless of the conditions each of us is facing in everyday life. You are in this world because you are wonderful, and you may be reminded of that through my healing. See you all on November 5! Copyright©2018 ははごころ指圧治療院 all rights reserved.